www.joinindianarmy.nic.in. 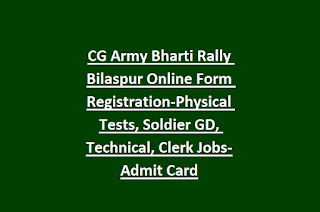 8th/10th/12th passed candidates are eligible to attend the CG Army Bharti rally at Behtariya Stadium, Bilaspur (Gates will be open from 03:00 AM and closed on 06:00 PM). Admit Card for this CG Army rally will be mailed to 18-05-2019 to 31-05-2019. 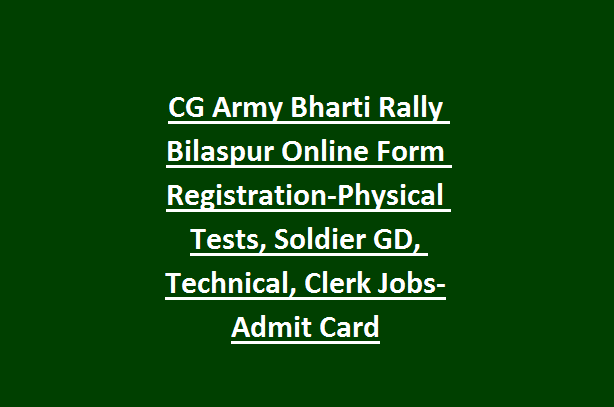 CG Bilaspur Army Recruitment Rally Soldier jobs Physical Tests, Height, Chest, Weight, age limits, selection process, qualifications and other details will be updated below. For Soldier GD 17 ½ to 21 years and for all other Soldier Category age limits are 17 ½ to 23 years. For Soldier Technical/Storekeeper/Clerk/NA/VET-12th pass/Intermediate qualified candidates are eligible to apply. Selection for this Army Soldier jobs will be based on Physical Tests, medical tests and written exam CEE. 1600 meters running to be completed in 05 Min 45 seconds. Chest for Soldier Technical, Tradesman posts is 76+5 cms and all other posts 77+5 cms. Weight 48 kgs for Soldier GD ST and Soldier Tradesman jobs and for all other posts weight is 50 kgs. Height for Clerk/SKT, Soldier GD ST candidates is 162 cms. For Soldier GD, Tradesman posts 168 cms and for Soldier Technical posts height is 167 cms. Apply online to attend the recruitment rally at Bilaspur. All the district candidates of Chhattisgarh state is eligible to apply online at www.joinindianarmy.nic.in. Admit Card will be email to candidates registered mail id only.